Product Spotlight – Pro-Line Ford F150 Raptor X-Maxx Body « Big Squid RC – RC Car and Truck News, Reviews, Videos, and More! Set-Up And Install Notes- To save you time, the Raptor comes completely pre-cut, something that we really appreciated around our busy offices. We gave the inside of the body a quick wash with mild dish soap, then let it dry. We then put on the included window masks. Next we applied two coats of Duratrax fluorescent orange paint (rattle can, heck ya! ), allowing the body to dry about 15 minutes between coats. We then backed the flo-orange with one coat of Duratrax white backing paint. 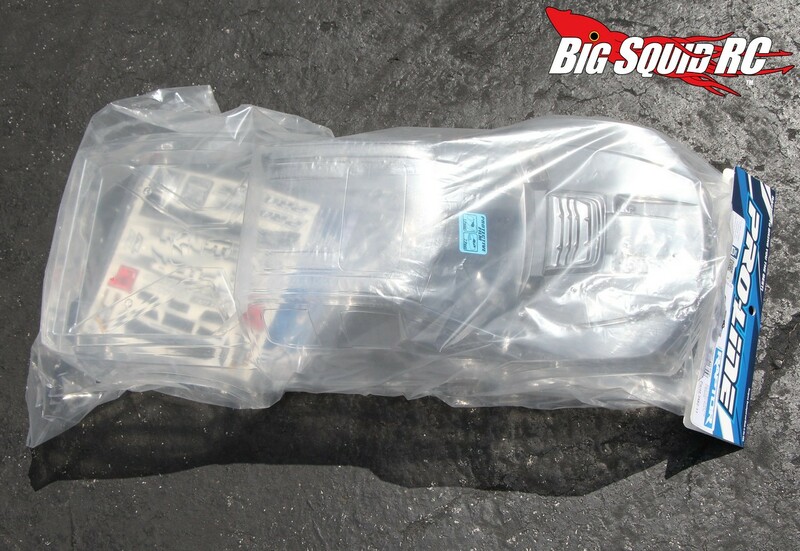 Next we peeled off the overspray protection film from the outside of the body. We then grabbed our stock body and removed its inner mounting cage. This required the used of a 2.5mm hex driver. Next we re-installed the cage onto the Pro-Line body and applied some stickers. Overall we found the Pro-Line body to be very easy to paint and to mount. In total, for a one color paint job like ours, you are looking at about 2 hours from start to finish. How It Looks- For years (decades?) 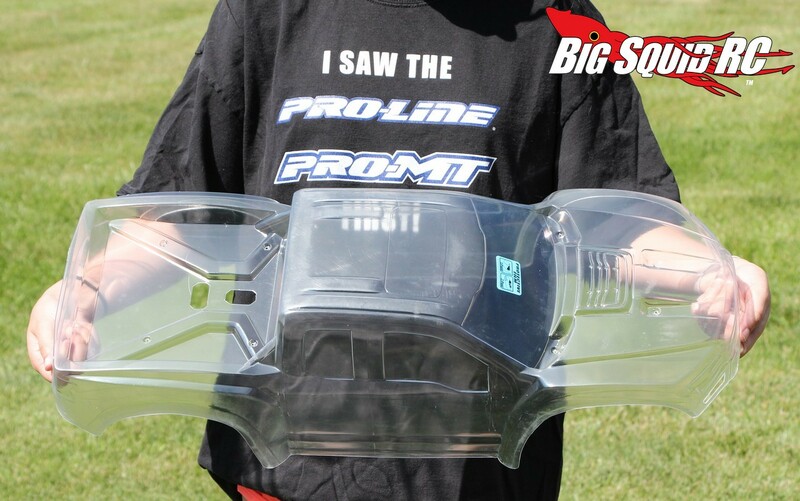 Pro-Line has been known as putting out the trickest looking bodies on the market. Needless to say, our test crew thought the Raptor was totally lit. The body has a sleek design, yet looks like it is tough enough to own whatever piece of property that it is sitting on. When hitting our local bash spot everyone had to come over and give the Raptor a close look. 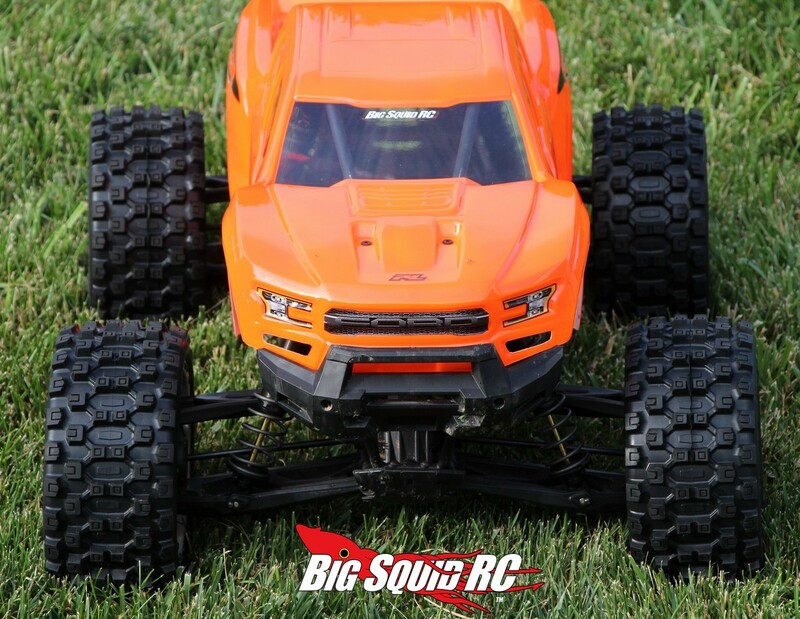 Its sleek, yet tough looks, combined with scale detailing here and there, made the Raptor at true head turner. Durability- The Raptor is molded out of fairly thick Lexan and that helps it take a beating with the ability to keep coming back for more. Add that tough Lexan to the fact that the stock plastic inner roll-cage bolts inside of it, and we found the body to be exceptionally tough. 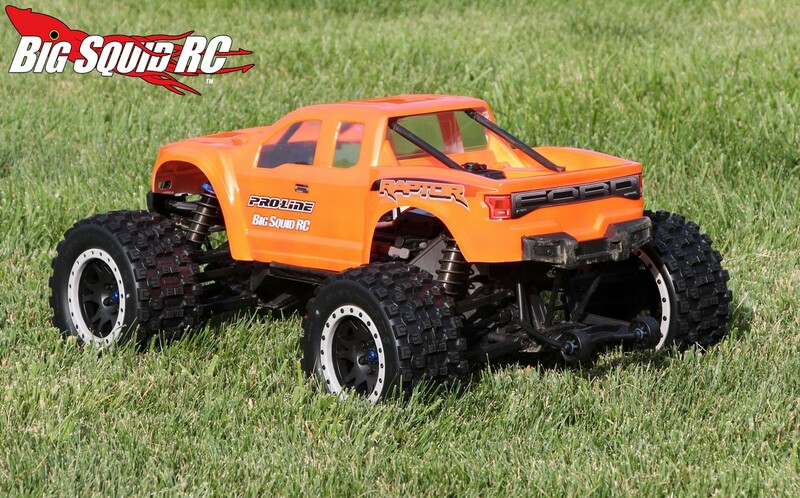 We have rolled, smashed, hucked, and thrashed the heck out of our X-Maxx, and the Raptor body is still looking sharp. Sure, it has plenty of scratches on it, but it has held up very well. The stock lever activated mounting system works well and the Raptor body is custom made to make use of it. 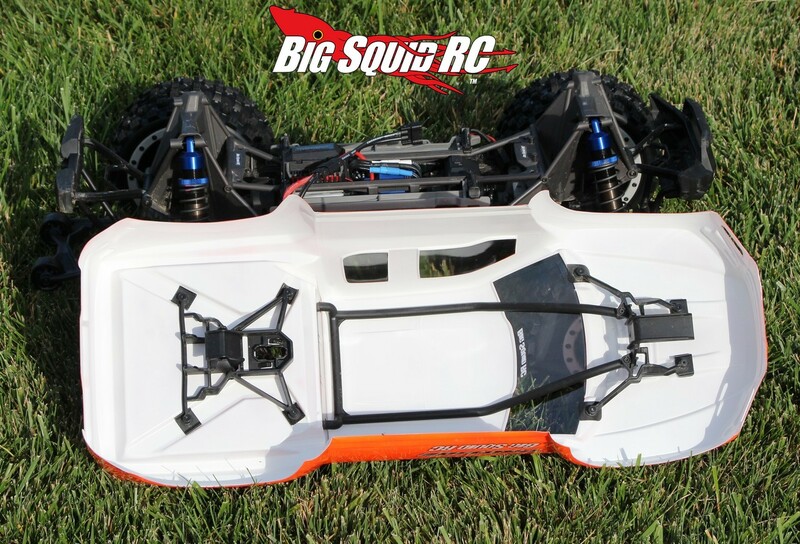 You’ll need to remove the four 2.5mm bolts from the front of your stock body, plus remove 6 more from the rear, to move the stock cage over to the Raptor. This took us virtually no time at all at right around 5 minutes. We found that the two holes that were pre-drilled in the rear window were too small to fit the stock X-Maxx cage through. We grabbed a body reamer and a few seconds later we had made the holes slightly larger so that the cage would fit through. Final Verdict- One of the most profound changes you can make on any car is a new body. 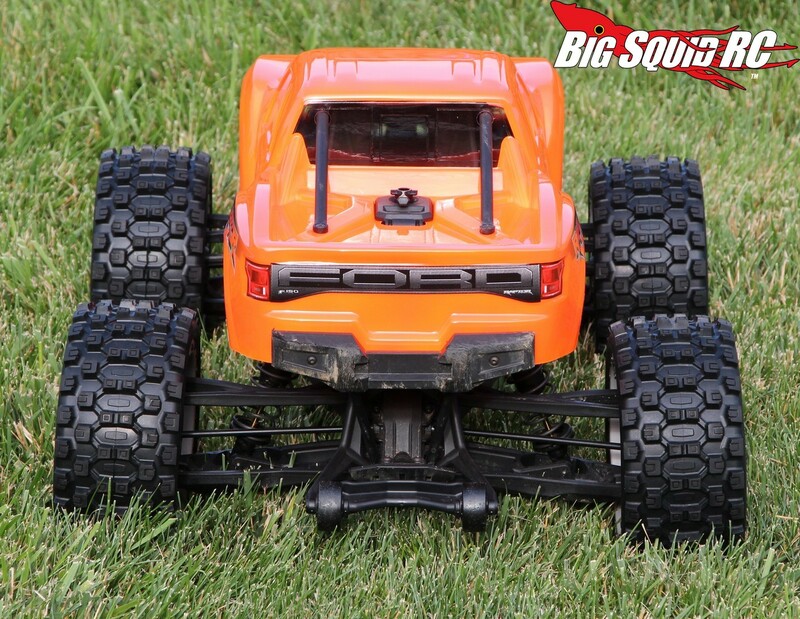 We totally loved the Pro-Line Ford F150 Raptor on our X-Maxx. It gave our truck a trick new look and held up like a champ. 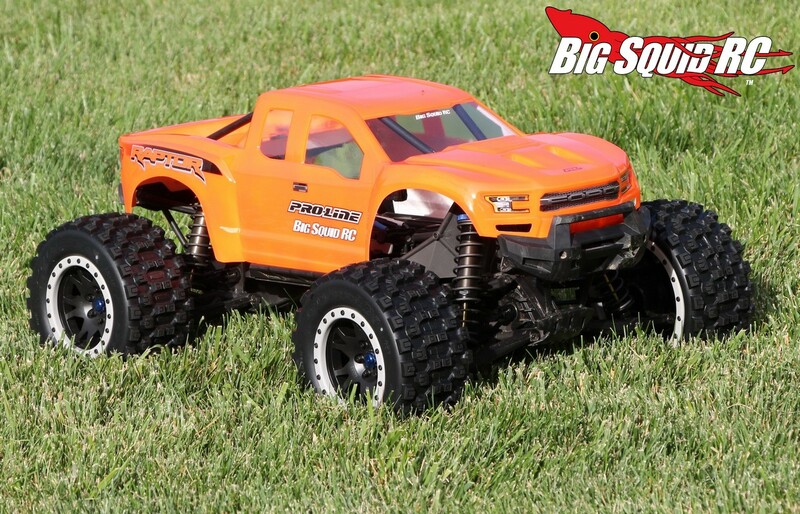 Yes, if you are an X-Maxx owner we can very highly recommend the Pro-Line Raptor to you.